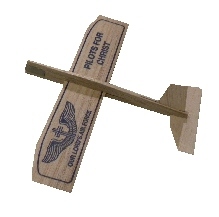 Balsa wood airplane gliders, with Pilots for Christ logo on wings. Great for airshow giveaways, or just handing out to children. Packaged, must be assembled. Fragile. Minimum ordering quantity is (10) airplanes, with discounts for higher quantities. Please see pricing message.